Tana Toraja has unique culture set in stunning scenery. Globalisation and tourism may have impact, but if you venture away from the tarmac roads you will find soon a way of life that has not changed much in the last 100 years. 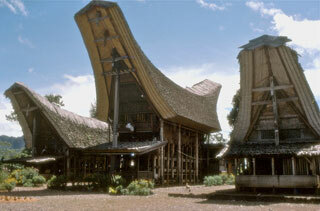 Traditional Tongkonan houses stand proudly in this setting. These intricately decorated houses with upward-sloping roofs are the center of all Aluktodolo (Torajan religion before the coming of missionaries; the ancestors belief) rites; from storing the harvest in the carved rice barns, "alang", to slaughtering sacred water buffaloes at a week or more-funeral ceremonies. Tana Toraja's beauty is also reflected in its people. Although they are devoutly Christian (there are small number of Muslims especially in the southern area), they combine this religious belief with magic and mysticism, and welcome visitors to witness their ceremonies. This article uses material from the Wikipedia article "Toraja villages", which is released under the Creative Commons Attribution-Share-Alike 3.0 License.